Here is the report of the past three months about what we have been doing in Kochi City, Kerala, India among the beggars/homeless population, orphans and Bible college students. A brief background: My wife and I were both saved and baptized in America. We attended church in addition to a house church with passionate believers. When we returned to India, we found a church, and I was able to participate in some ministries that I became passionate about. Unfortunately my family didn’t feel connected in the church, and our zeal dried up. We prayed for God to lead us to a new fellowship of believers, and miraculously He soon answered our prayers! We became involved in ministries in this new church and found deep fellowship and community with fellow believers. We have found a church family similar to what we had in America, and praise God for how He has revived our spirits and passions through them! We are now engaged in homeless and orphan ministries. 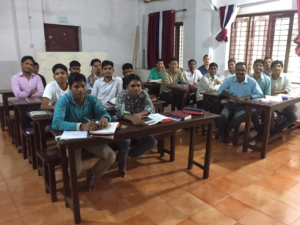 We also work with North Indian bible college students, teen, professional and cancer charity ministries. I was born and raised in Andhra Pradesh State. We now live in Kochi City, Kerala State. Kerala is like America for other Indian states, therefore other state people come here for jobs as well as to beg. 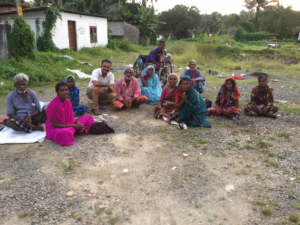 They might have homes in their native state, but due to draught, unemployment, or health issues, they come Kerala to beg. During the night they sleep on the street and cook food on the road side. These people are desperate to survive and send help to their families in their native villages. These beggars ages range from young to old, and sometimes we can even find a mother with her tiny baby. I have spent many hours with them in teaching and preaching the gospel and Biblical truths. I have heard many heartbreaking stories, and we cry with them while praying with them for their families and lands. We praise the Lord for giving us such a wonderful opportunity to preach to and come alongside these beggars in my and my wife’s native land. We praise The Lord for a beggar named Jayakumar, who is a believer and encouraged us to continue to preach the gospel among his fellow beggars. We praise The Lord for some of them who have become Christ followers, and removed Indian sacred threads from their wrists and necks. test the genuineness of their faith, so please pray for genuine transformations. God. Pray that they understand this concept rather their polytheism beliefs of multiple gods. Pray that once they go back to their native village, they will not be influenced by their wives, children, family members, and/or community to indulge again in idol worship and other pagan ways of worshiping their gods, forsaking the one, true God. Pray that in the near future, Lord willing, that I can visit these villages and make some arrangements to ensure these new believers are connected with a local church, or even start a new church there. 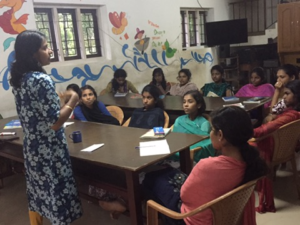 Sandhwanam Orphanage hosts twenty girls in age ranging from five to twenty-two years old. It’s a secular organization, and the girls are from different religious backgrounds. Each girl has a brokenness and a difficult past. In July we had prayed for a woman counselor. A church did arrange an experienced person for us, but unfortunately she was injured. As a result, it fell to me to work with these girls. With these girls, I teach through the Bible. We also teach vocational classes on computers, mobile technology and social media. I am also teaching them some basic English that will help them in their endeavors. My wife also shared her testimony with the girls. It was powerful hearing this message from a women native to their state! We praise the Lord for the new games that we taught the girls to engage them and also for the opportunity to teach the through the Bible and pray with them. We praise the Lord for the opportunity for my wife to share her testimony. She was a little hesitant to share in the beginning, but after the new church’s word of encouragement and prayers she was able to share! Pray for Raji, who had started her weekend classes and is doing a Bachelor of Arts in tours and travels. Pray that she would utilize her opportunities well in learning. She suffers from loneliness and insecurity as her mom is mentally ill, and her dad left long ago. It has been very difficult for her these days. Pray for Shibitha, who is a Muslim and hesitating to touch the Bible though she responds well with Bible stories! Pray for few mature Christian women who can counsel the girls suffering from some mental illnesses. Pray for these girls – for a desire for hard work and for understanding of life and education. Pray that they will have gratitude towards the facilities and people who serve them selflessly. Some girls are becoming targets for boys when they are at schools/colleges, and that is bringing new issues into the home. Pray they will not be influenced by all of these things, but they will be focused on their education. Pray that we will start seeing their love towards God growing and their ultimate submission to Christ. Praise The Lord for the improvement in the students’ English learning. Pray that the time they are here, they will learn everything they need to be effective in the field. Pray that they understand and learn English.